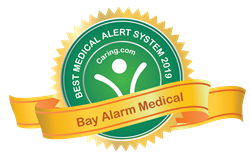 Caring.com, the nation’s most visited website for senior living reviews, has named Bay Alarm Medical to its list of top medical alert systems for 2019. The medical alert provider was recognized as the Best for Customer Service and Low Monitoring Costs. Bay Alarm Medical was one of fourteen companies that qualified for the list based on its demonstration of excellent customer service, transparency and affordability. With a variety of medical alert systems on the market, this list was developed to help seniors and their loved ones easily identify those with the highest overall value. As a part of the review process, Caring.com also identified key features to look for in a system such as waterproofing, fall detection technology, location monitoring and mobile help button. “Our goal is to bring innovative and intuitive solutions to market that will not only support seniors to age in place, but also help others with different medical needs to recover at home,” explains Andy Ginjupalli. For over 12 years, Bay Alarm Medical has offered the best senior life-saving alert systems in the nation. The company works closely with a USA-based monitoring partner to create a network of highly reliable emergency response centers. Both state-of-the-art centers are full duplicates of each other and are located in Ogden, Utah and Rexburg, Idaho. The service provides in-home, mobile GPS, and in-car medical alert options and supports over 170 languages to effectively communicate with non-English or English-as-a-second-language clients. For more information, visit https://www.bayalarmmedical.com/ or call 1-877-522-9633.